I’ve had my KitchenAid mixer for about 4 years now, but have never bought – or needed – any of the optional attachments that are available for it. Sure, there was a time I really wanted the ice cream maker attachment…well, maybe I still do…but I digress. And then, when J started bringing home deer and we saw the cost to get them processed, we discussed how nice it would be if we could grind up our own deer at home. ::lightbulb:: They make a grinder attachment for my KitchenAid! So I ordered it. And then it sat in the cabinet until this season. And when J brought home his second deer, we broke it out and made some deer sausage!! Not only did it save us some bucks (haha…bucks), but it was also fun to spend that time together in the kitchen. Sage and Italian deer sausage, nicely stocked in our freezer in conveniently patties – good for breakfast sammiches or with eggs. 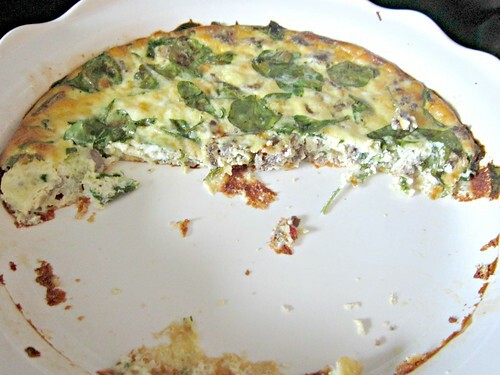 Or even cooked out of the patty form to use in….quiche! A few weekends ago, when my parents came up so my mom could go dress shopping with me, I wanted to make breakfast so everyone could eat before starting the day. Since we had all that yummy sausage in the freezer and J loves quiche, so it seemed like the logical choice to use make a venison quiche! It took about 5 nanoseconds for it to go from a full quiche to barely any left in the pan. Good thing I made two! And by the time we got back from shopping and had some for lunch, it was alllll gone. Dress shopping is hard work, y’all! Well, perhaps the guys working on the house was a little more hunger-inducing than shopping. And maybe they ate the majority before me and mom got home. But regardless of who devoured it more quickly, the fact is that it was damn delicious! Especially with a fresh batch of salsa that I made the night before. With roasted poblanos in it. Um…yeah. ‘Twas good. Quiche + homemade salsa = da bomb diggity! Heat a large skillet over medium-high heat and cook the sausage for 2-3 minutes until browned. Remove from heat to a papertowel lined plate to drain any fat/grease, and let cool for a couple of minutes. 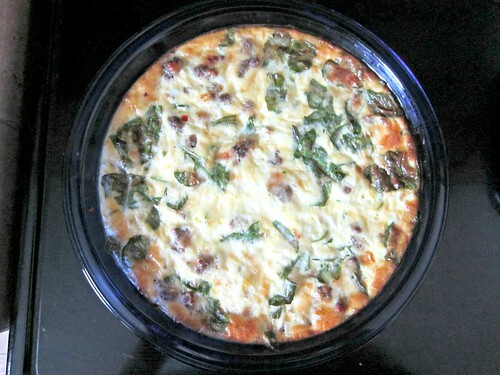 In a medium bowl, combine the sausage, spinach, and cheese. Stir to mix well. Sprinkle with flour and mix again, then spoon the mixture into the prepared pie plate. Pour the egg mixture over the sausage mixture and use a fork to make sure the ingredients are all distributed evenly. It’s ok if some of the spinach or sausage stick up above the egg mixture. Press it down the best you can and be done with it.